Beverly's Official Blog | News and findings from world of crafts, scrapbooking and more: We Have A Winner! I have to pick just one favorite! Impossible! =) I am very fond of Pumice Stone though. It is a chameleon color and quite versatile. Anita, to claim your prize, send an email to terryu@beverlys.com. Include "Tim Holtz Distress Ink Contest" in the subject line. Please include your mailing address, and your ink should arrive just in time for some fall crafting! Thanks to all who played along! 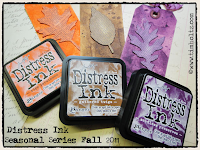 I loved hearing about your favorite colors of Distress Ink, and there are a few colors I'm looking forward to trying myself! There are still a few sets of this limited edition Distress Ink available. Contact your local Beverly's Fabrics & Crafts to purchase yours today.